Once the cut lengths come off the saw with nice square ends, the ends of the cable can now be dressed for a connector. Dressing the ends may involve multi-step cuts in each end. One of the most important quality features of dressing the ends of a cable involve removing the outer jacket and insulator without nicking the inner conductor. This is where an all-electric CNC semi-rigid coax stripper simplifies the process. 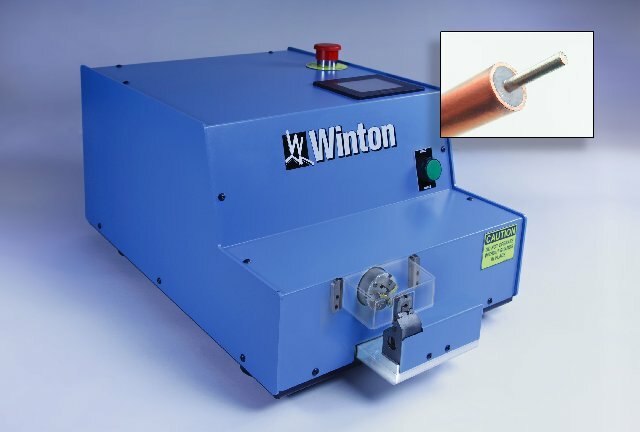 Winton’s model CS6 coax stripper is designed to remove the outer jacket and the insulator in a series of precision seamless coordinated motions. This 2 axis cnc stripper uses high precision stepper motors to insure the correct amount of material is removed leaving the center conductor unaffected. The touch screen makes it simple to program in the final stripped lengths and diameters. The microprocessor takes care of the rest. Precision and repeatability…that is what you will be adding to your manufacturing process by employing a Winton coax stripper. Give us a call to learn more! Winton 21434 Coax from Winton Machine on Vimeo.